The Tomb of Esther and Mordechai is located in Hamadan , Iran . Believed by some to house the remains of the biblical Queen Esther and her cousin Mordechai , it is the most important pilgrimage site for Jews in the country . In 1891 , the tomb was described as consisting of an outer and inner chamber surmounted by a dome about 50 feet (15 m) high . The dome had been covered with blue tiles , but most of them had fallen away . A few tombs of worthy Jewish individuals were located within the outer chamber . According to Stuart Brown , the site is more probably the sepulcher of Shushandukht , the Jewish consort of the Sasanian king Yazdegerd I (399-420 A.D.) . Another tradition first recorded during the Middle Ages places the graves of Esther and Mordechai in the Galilean archaeological site of Kfar Bar'am , close to the kibbutz of the same name , Bar'am , along Israel's northern border with Lebanon . 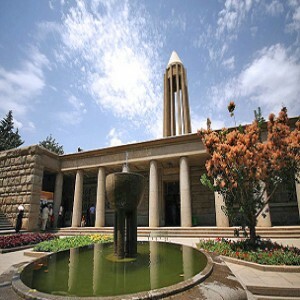 The Mausoleum of Avicenna is a complex located at Avicenna Square , Hamadan , Iran . 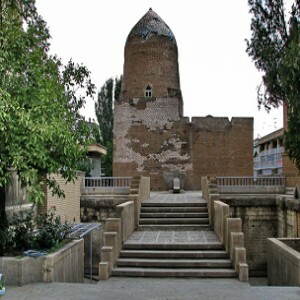 Dedicated to the Iranian polymath Avicenna , the complex includes a library , a small museum , and a spindle-shaped tower inspired by the Ziyarid-era Kavus Tower . Designed by Hooshang Seyhoun , it was built in 1952 , replacing an older building dedicated to Avicenna which was destroyed in 1950 . The Pahlavi government had plans to build the mausoleum since at least 1939 . The mausoleum was eventually dedicated in a grand ceremony in May 1954 , and the avenue running in front of it was also renamed in honor of Avicenna . As the monument was a central element of the propagation of Iranian nationalism by the Pahlavi government , it was consequently in danger of being defaced , but as Khomeini himself was an admirer of Avicenna , the square was not renamed after the 1979 Revolution . 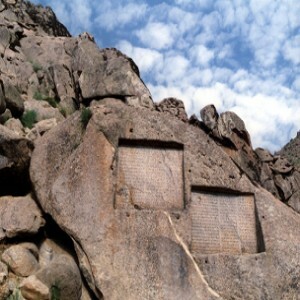 Ganj Nameh is an ancient inscription , 5 km southwest of Hamedan , on the side of Alvand Mountain in Iran . The inscriptions were carved in granite in two sections . The one on the left was ordered by Darius the Great (521-485 BC) and the one on the right by Xerxes the Great (485-65 BC) . Both sections were carved in three ancient languages : Old Persian , Neo-Babylonian and Neo-Elamite . The inscriptions start with praise of the Zoroastrian God (Ahura Mazda) and describe the lineage and deeds of the mentioned kings . Later generations who could not read the Cuneiform alphabets of the ancient Persian assumed that they contained the guide to an uncovered treasure ; hence they called it Ganjnameh . The name literally means "treasure epistle" , but it has also been called Jangnameh whose literal translation is "war epistle" . "The Great God Ahuramazda , greatest of all the gods , who created the earth and the sky and the people ; who made Xerxes king , and outstanding king as outstanding ruler among innumerable rulers ; I the great king Xerxes , king of kings , king of lands with numerous inhabitants , king of this vast kingdom with far-away territories , son of the Achaemenid monarch Darius ." Two modern contemporary carved tablets have been placed in the site's parking lot with Persian explanation and its English translation . The Ali Sadr Cave originally called Ali Saadr or Ali Saard (meaning cold) is the world's largest water cave which attracts thousands of visitors every year . It is located in Ali Sadr Kabudarahang County about 100 kilometers north of Hamadan , western Iran (more accurately at 48°18'E 35°18'N) . Because of the cave's proximity to large cities such as Hamadan , it is a highly recommended destination for tourists from all corners of the world . Tours of the cave are available by pedalos . Alisadr is the world's biggest water cave , where you sit in a boat and watch the view . This cave is located at 48°18'E 35°18'N , in the southern part of Ali Sadr village . The cave is entered at the side of a hill called Sari Ghiyeh which also includes two other caves called Sarab and Soubashi , each 7 and 11 kilometers from Ali Sadr Cave . Apparently , the water in Ali Sadr cave stems from a spring in Sarab . In the summer of 2001 , a German/British expedition surveyed the cave , finding to be 11 kilometers long . 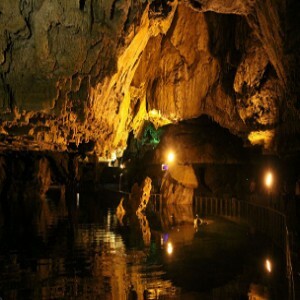 The main chamber of the cave is 100 meters by 50 meters and 40 meters high . The cave walls can extend up to 40 meters high , and it contains several large , deep lakes . The cave has a river flowing through it and most travel through the cave system is done by boat . More than 11 kilometers of the cave's water canals have been discovered so far . Some routes are 10 to 11 kilometers long and all lead to "The Island" , a centrally located large atrium . 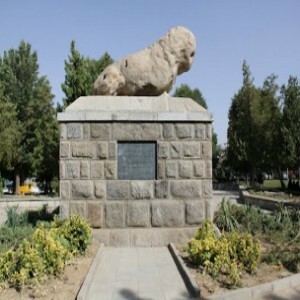 The stone lion of Hamadan is a historical monument in Hamadan , Iran . The stone lion -one part of the 'Lions Gate'- sits on a hill where a Parthian era cemetery is said to have been located . When first built , this statue had a twin counterpart for which they both constituted the old gate of the city . During the Islamic conquest of Persia , the victorious Arabs referred to the gate as bâb ul-asad . The gates were demolished in 931CE as the Deylamids took over the city . Mard�?vij unsuccessfully tried transporting one of the lions to Ray . Angered by the failure to move them , he ordered them to be demolished . One lion was completely destroyed , while the other had its arm broken and pulled to the ground . The half demolished lion lay on its side on the ground until 1949 , when it was raised again , using a supplemental arm that was built into it . Iran's Cultural Heritage Organization reports that the lions were first thought to have been built by the orders of Alexander the Great to commemorate the death of his close companion Hephaestion .